Grilled cheese is probably one of the most nationally loved foods here in the USA. Sure, the French have the Croque Monsieur's, and the English have their toasted cheeses, but we Americans take grilled cheese, and really the love of melted cheese on bread in general, to a whole new level. In Cleveland, where I grew up, we have a restaurant called The Melt, which specializes in huge, gratuitous grilled cheeses so thick you can barely get them in your mouth, and full of crazy toppings like chorizo and potato, or whole pierogi. You can even custom make a sandwich with just about anything you can imagine in it- sauerkraut, pork belly, pulled beef brisket, even meatloaf! 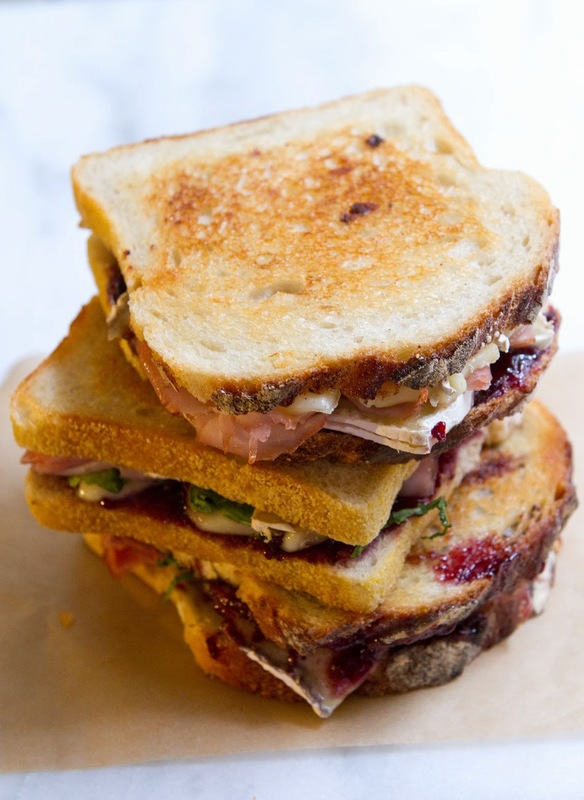 Meanwhile, in New York City, we have Little Muenster, purveyor of adorably perfect little grilled cheeses, and Milk Truck, the on-the-go purveyor of grilled cheese, and a chain of grilled cheese spots called Melt Shop. 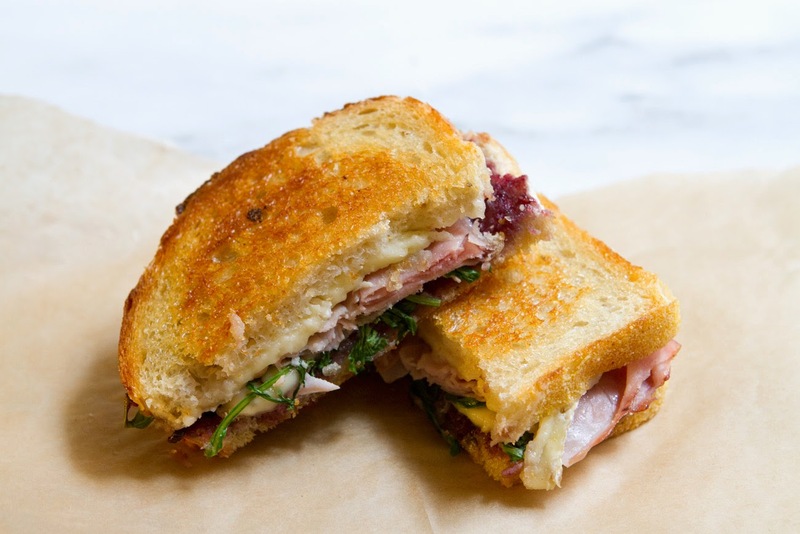 And then there's Beechers, the Seattle based fromagerie with a Flatiron location whose grilled cheeses sport fantastic, exotic cheesy insides, and perfectly buttery caramelized toasted outsides. But the best grilled cheeses are always the ones you make yourself. You can decide if you want them so cheesy it squishes out the sides, or so toasty the crunch can be heard across the room, and you can come up with any crazy combination of toppings you like. 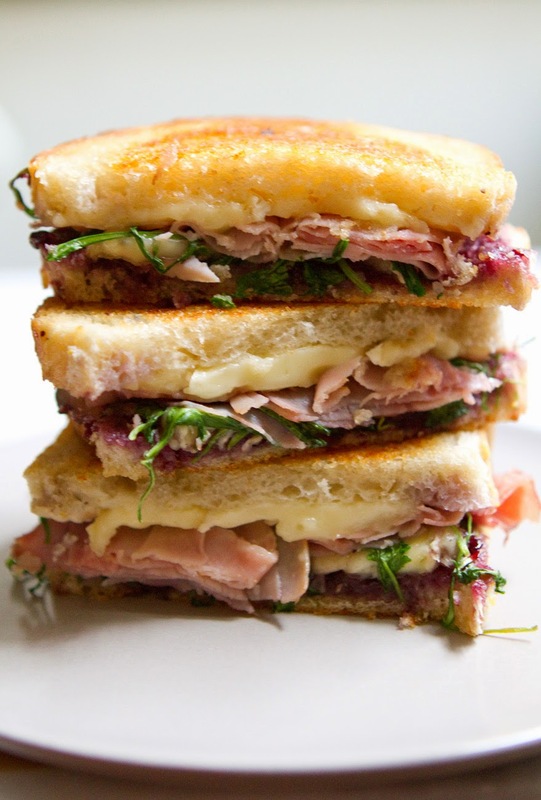 This just so happens one of my favorites, thin sliced ham, creamy brie, sharp arugula, and a delightful layer of raspberry jam. 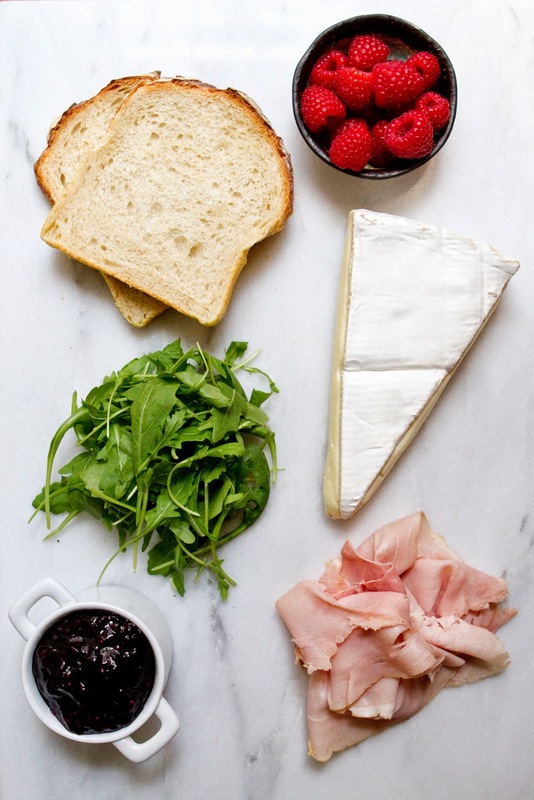 Ham and cheese is a classic combination, and brie is such an easy cheese to pair with other flavors, its mild creaminess is the perfect companion to the sharp arugula and the sweet raspberry. This is a lovely lunch to throw together when you have the ingredients on hand, or could be a delightfully simple weekday dinner for two! Using 1 tbsp butter, butter one side of each slice of bread. This is the outside of your sandwich. 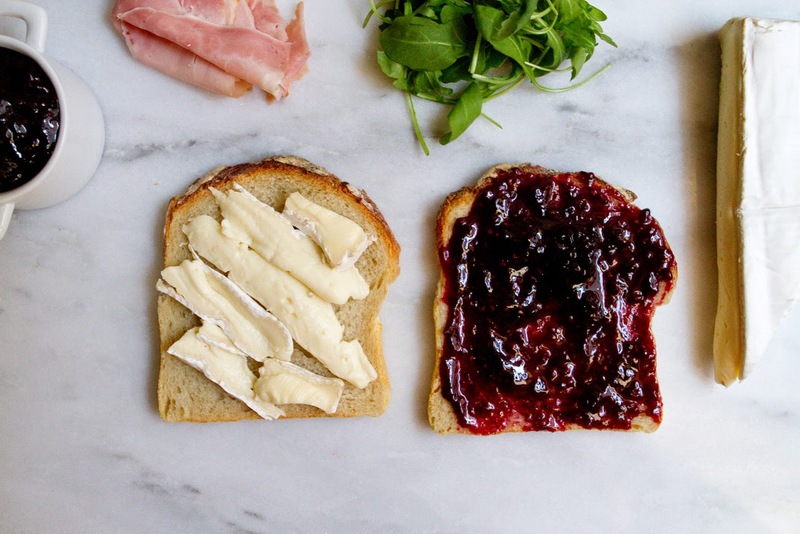 Thinly slice the brie, set aside. To assemble sandwiches, take two pieces of buttered bread and place them buttered side down on a clean plate. Spread approximately 1 tbsp raspberry jam on one slice of bread. Take 1/2 the total amount of sliced brie and split it between both pieces of bread. 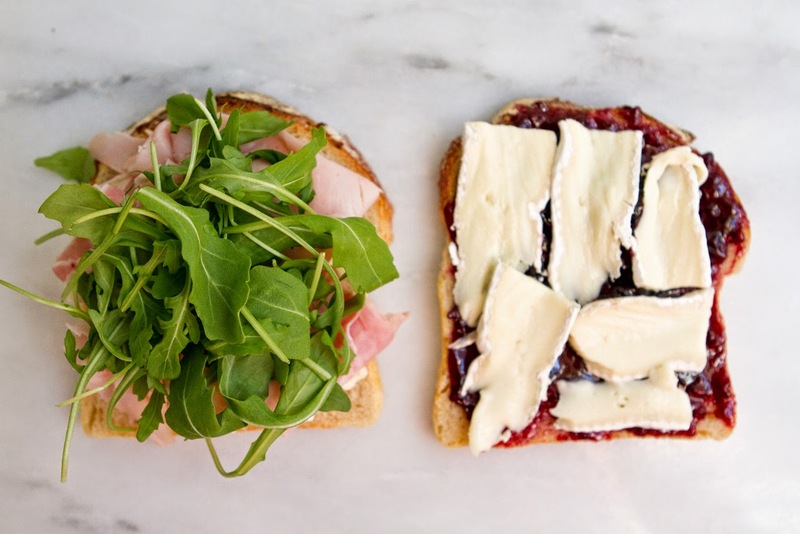 Arrange 1/2 the ham on one slice of bread, and 1/2 the arugula on the other. Close sandwich and set aside. Repeat with remaining ingredients to make 2nd sandwich. Heat remaining 1 tbsp butter in a large skillet over medium heat. Place sandwiches in hot skillet and cook for approx 5 min, checking for toasted-ness occasionally. Flip sandwiches, and cook another 5 minutes. Sometimes I cover my pan to make my sandwiches super-duper melty. 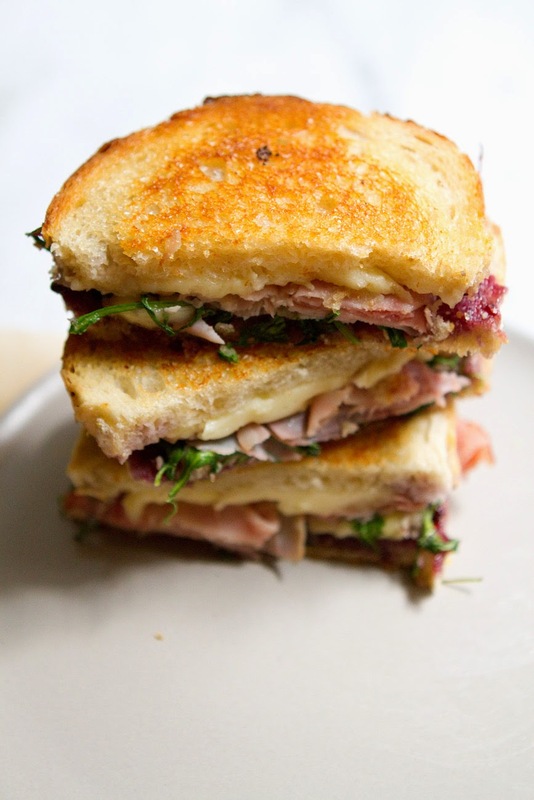 Once both sides are nicely golden brown and the cheese has melted, remove sandwiches from heat, cut in half, and enjoy!